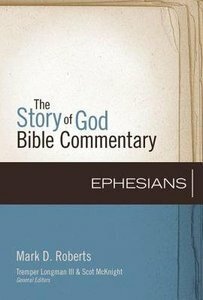 About "Ephesians (The Story Of God Bible Commentary Series)"
Mark D. Roberts, Ph.D., (New Testament and Christian Origins, Harvard) is a pastor, author, speaker and blogger. Since 1991 he has been the Senior Pastor of Irvine Presbyterian Church in Irvine, California. He teaches classes in New Testament for Fuller Theological Seminary and San Francisco Theological Seminary.Mark has written several books, including Dare to Be True (WaterBrook), Jesus Revealed (WaterBrook), After "I Believe" (Baker), and Ezra, Nehemiah, EstherCommunicator's Bible Commentary (Word). His most recent books are No Holds Barred: Wrestling with God in Prayer (WaterBrook) and Can We Trust the Gospels? : Investigating the Reliability of Matthew, Mark, Luke, and John. Mark serves on the editorial board of Worship Leader magazine, where he publishes articles and reviews, including his regular column "Lyrical Poetry." He often speaks for churches and other Christian groups, and has been interviewed on over fifty radio programs nationwide.